A new play area in Felinfoel was officially opened today (20 March 2018) by the Chairman of Llanelli Rural Council, Cllr. John Evans. 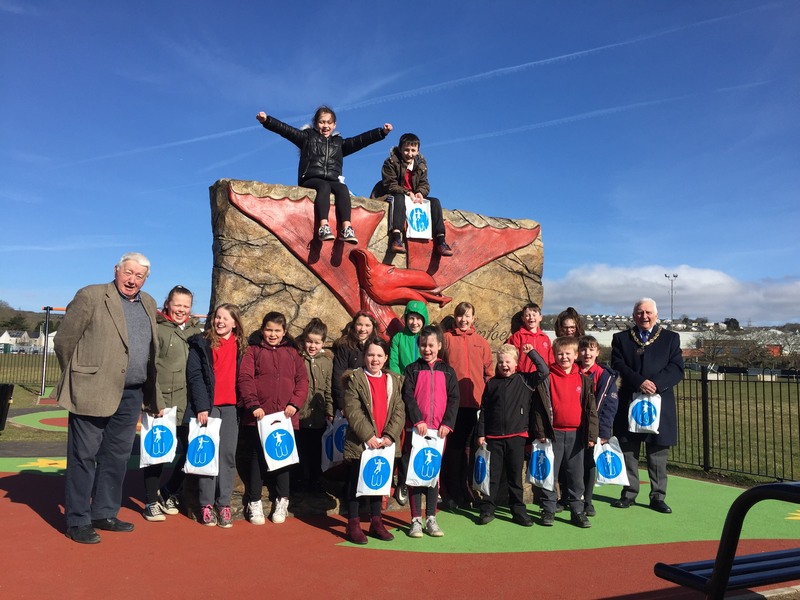 Children from Ysgol Y Felin enjoyed some time out of the classroom in the sun, where they received goody bags provided by Wicksteed Playgrounds as a thank you for their role in helping choose the final playground design. The play area opened to the public during the February half term break and has proved very popular with the young people and parents in Felinfoel. It contains a number of play stations for different age groups including a climbing wall which has has a dragon sculpture. The new playground, provided by and to be maintened by Llanelli Rural Council, is situated behind Ynyswen on land inbetween King George’s Playing Fields and Ysgol Y Felin. It is accessible by a new footpath situated between the school and the houses on Ynyswen. The play area has been fully funded by Llanelli Rural Council after it was transferred the land from Carmarthenshire County Council under a 99 year lease.